At Two Eagles Lodge, different from many B&Bs, you can enjoy the freedom to come and go as you like, since your room has a private entrance and bath. A hot breakfast is offered each morning, or you may prefer to prepare something on your own (we supply breakfast cereals, fruits, breads, etc.). For the convenience of our guests, we offer a shared lounge with games and books as well as a kitchenette with convenience appliances (fridge, microwave, coffee pot, etc.) --whether you want a midnight snack or prefer to pack a picnic to enjoy at one of the many beautiful lakes on Vancouver Island. 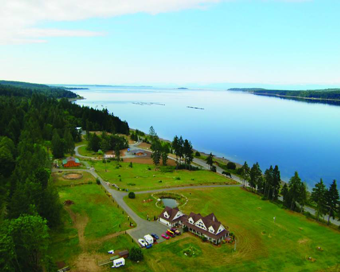 And, when you’re done relaxing, we can’t wait to introduce you to all there is to do on Vancouver Island--an “outdoor person’s paradise” that stole our hearts and spurred us to relocate in 2006 from Maryland where we’d lived our entire lives. Whether you enjoy kayaking, hiking, biking, scuba diving, golfing, skiing, fishing, touring the backroads on motorcycle, or just packing a picnic and relaxing by the water, Vancouver Island, British Columbia is the place to be. The weather is great (even when it rains), and the breathtaking sights around the Island are just a short drive from our centrally located Vancouver Island B&B and vacation rental. We look forward to meeting you and to sharing our slice of Heaven with you soon. Two Eagles Lodge opened in May 2007, and we invite you to share our slice of paradise with us.